One thing I love about blogging is receiving emails from people who are following their own radical homestead path. 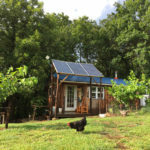 Frequently, the questions I receive are related to building and living in a tiny house, particularly an off-grid tiny house. Often I get asked for photos or a tour of our tiny house interior. If you’ve been following along for a while, you know that my husband built our 350 square foot home. (If you’re new to Homestead Honey, please check out this category for posts that I’ve shared as we’ve built.) 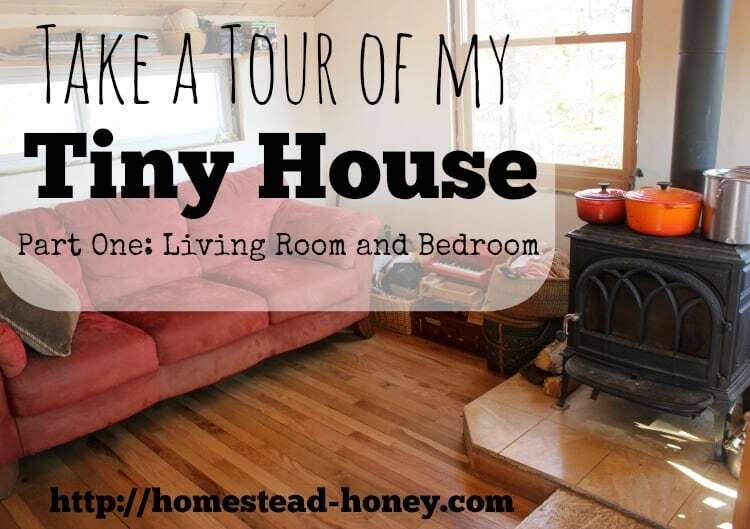 With hardwood floors in place, bookshelves neatly dividing the living room from the bedroom, and windows freshly washed, it seemed like the perfect time to take you on a video tour of our tiny home. Thanks for sharing your sweet & efficient home! Loved the great storage areas you’ve optimized! So neat to see your homestead “in person”. It seems so cozy and nice. Can’t wait for the next tour. Love your shelving dividers and the woodstove! Happy Thanksgiving! Thank you! I should have told the story of the shelf dividers – my husband had built them for our house in Oregon. They were too big for this house, but one day he had the idea of sawing them right down the middle to make two shelves! That’s what he did and I think they look great! That is so sweet! We’re going to try to finish the built-in booth seating in the kitchen before I do the next video, but I promise it will be as soon as possible! Love the progress and the way your bedroom is set up but can I ask where do your kids sleep? I was wondering the same thing. Love your house! Thank you! We all sleep in the King sized bed. The kids are young and great sleepers, so it works for now, but at some point we’ll have to consider an addition or a different bedroom configuration. 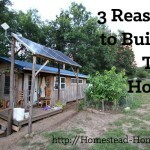 Your dedication to homesteading is remarkable. Your example of “one step at a time” is something those that are considering this type of life can learn a great deal from. But you also show that it can be done! Appreciate your being willing to be so open and honest. Thank you, Karen. That is such a kind thing to say. 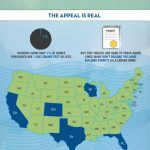 We’ve been homesteading for about 16 years now, making mistakes along the way, and it feels really good to share what we’ve learned. Of course all of the building credit goes to my husband, but what is really wonderful is that we make a great homesteading team. I feel very lucky. You have done so well with the storage and I love how you separated the rooms with the book shelves. Very nice! thanks Vickie! We still desperately need more storage, but we’re doing our best to fill every nook and cranny! I have to ask, but you don’t have to answer. The house seems very open and public. Especially with the kids sleeping with you. How do you and your husband ever get some private time? 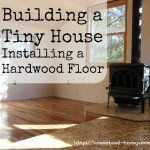 Your new floors and beautiful, and i am totally jealous of your cute little stove! It’s probably the second question that everyone secretly wants to ask – after all, I invited you all into my bedroom! Let’s just say that humans have been incredibly creative about tight living quarters for years. But, it definitely comes up as “con” when you talk about tiny house living with children, and again, I think as our children age, we’ll find that we all need a bit more privacy. Your little home looks comfy, cozy, and inviting! Thank you for sharing your space with us! Thank you for taking the tour! It seems like a big wood stove for a small house. I broil in my 1800 sq. ft. house with the stove going! How do you do it? It is way too big of a wood stove for this tiny house! But it was what we already owned, and it seemed to make sense to use what we already had, rather than purchase a new stove. But it is definitely too much heat for such a small space. It would be more appropriate for a 1200 square foot house. Tiny homes fascinate me because when we first married we bought a 500 sf cottage. Not intending to live there long, we stayed for nine years and had four children in that house. It was a challenge, but can be done. Thanks for sharing a glimpse of yours. The space for all of the children seems to be the main challenge in our home! How fun that you were able to make it work for such a large family in such a small space! Thanks for sharing your house with us. Love it! I got inspired with ideas for storage for my house seeing this. Oh, I’m so glad! We are definitely learning tricks to make the best use of the small amount of space that we have! I was daydreaming about having a small home (not as small as a tiny house though!) and came across your webpage. So many questions come to mind: Where is the bathroom and kitchen? You must have an outhouse? But then how do you bathe? I see the lovely stove with cookware but where do you store your dishes and prepare food? Where do you store the food and eat it? An icebox? Major hats off to you for being able to live simply, and with children too! Thank you for sharing your tiny house. Thanks so much for reading. I haven’t yet done the tour of the kitchen and food preparation areas. Everything is a work in progress! We do not have an indoor bathroom, nor do we have a refrigerator. But we do have a freezer and it works well to freeze ice jug, which then get placed in coolers. Im curious when you decided to live on a homestead how much money did you save up for the house and the lot? Good one you! A sad event – the death of my Great Aunt, who was like another parent to me – enabled us to have the cash to purchase our land. We paid about $34,000 for the raw land and another $10,000 give or take, for our house materials (my husband did all the labor). We were able to pay cash for everything thus far, but have pretty much exhausted our reserves! For now, it’s the slow, steady process of sourcing free/cheap materials for future projects. Is it time for a tiny house tour part two?? I would love to see the rest of your home. It sure should be, Katie!! I’ve been waiting for my house to magically clean itself so I can take the video. I guess that probably won’t happen, so I should just let folks see my filthy mudroom! Yes, you guy’s did a great job on such a small space! I love all the storage space too. I can’t wait to see the kitchen and the kid’s room when it’s finished! 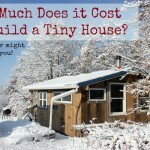 I’m thinking about one of those Tiny Houses, but I’d have to down size alot before that. Thank you Kathryn! We do love the way we’ve created a very large feeling space in a very small house. The fact that we have a beautifully high ceiling really makes the house feel open and airy, and we also have a crazily disproportionately number of windows (9) for such a small space!